Except this time it’s gonna stick. One of my favorite items to make is meatballs. They are a classic when it comes to cooking. They are also practical, functional, easy and downright delicious. They can be the star of the meal, or the sidekick, or even an appetizer. A good meatball recipe is key. From there, experimentation and sauces can be created to complement the different versions. The recipe below, is a classic recipe, easily inserted into any recipe. There are no fancy ingredients, or frills. Just good, every-ingredient-found-in-your-pantry meatballs. Combine beef, garlic, eggs, cheese, parsley, salt, and pepper. Add potato flakes. (Note: If using a fattier meat/combination, consistency might be sticky. Add potato flakes until meat can be formed into a ball without sticking to hands) Form into meatballs. Cover a pan with tin foil and place a rack on the pan. 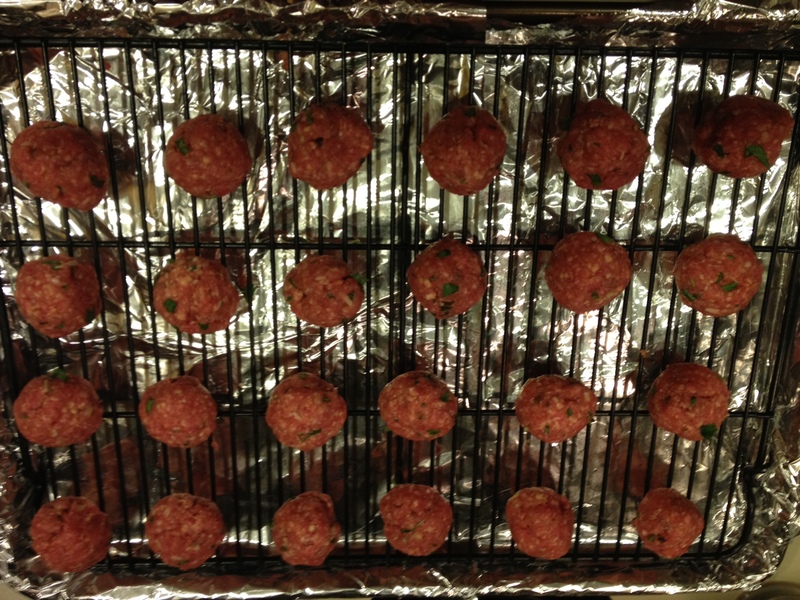 Make sure to use the baking rack as it allows the heat to circulate underneath the meatball. Bake at 350 degrees for 20-25 minutes. Keep in mind bake time will vary based on size of meatballs.